When it comes to gelato in Italy, there are many kinds and interpretations. However, the most clever idea I had ever seen is fruttini, which are real fruit stuffed with gelato (of the same fruit). Hence, you can find peaches with peach gelato filling, or lemons with lemon gelato filling. You can even finds nuts (and these are mind-blowing! ), such as walnuts with walnut gelato stuffing, or chestnuts with chestnut gelato filling. To remind myself of this amazing dessert, I had to see a stunning picture featured on the post “Second string strawberries save the day” that you can find on Roger Stowell’s wonderful blog Camerahols / Food, Photography and France. Roger Stowell, a British renowned professional photographer, publishes his marvelous photographs from the Vendée region in France. 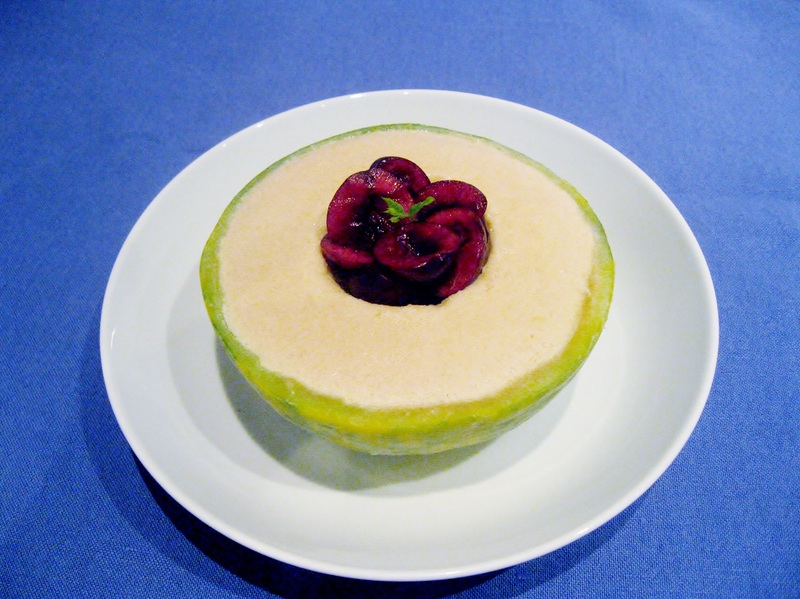 This time he posted a gorgeous picture of Chanterais melon with strawberries. 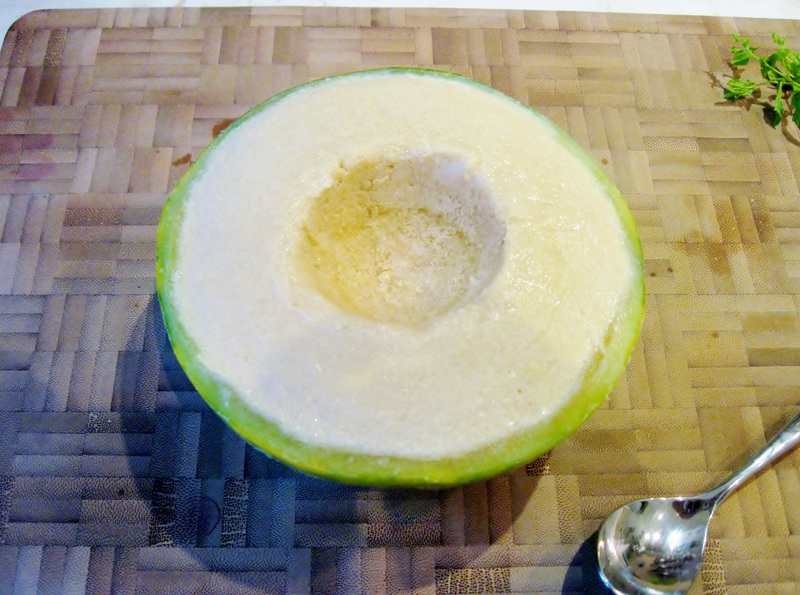 What really impressed me was the detail of the melon pulp and so, my first thought was that of making a melon stuffed with a melon semifreddo. 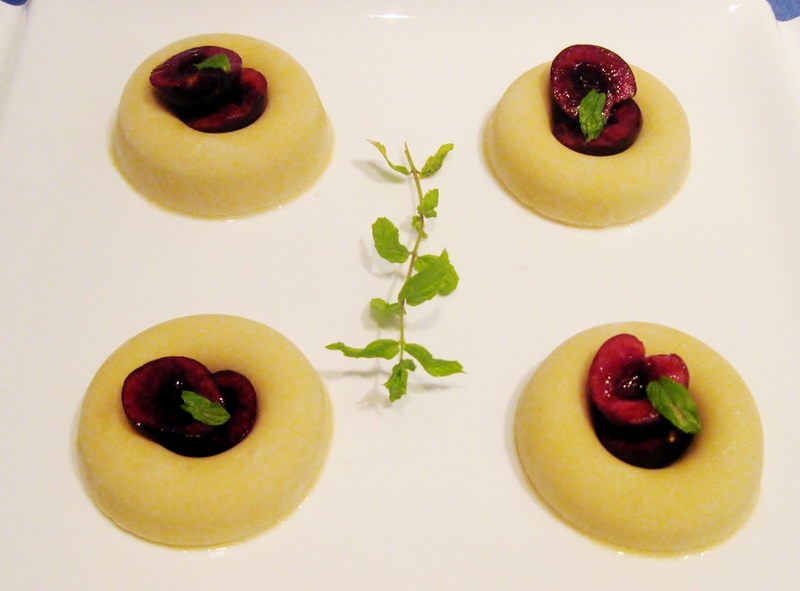 From the picture on Roger Stowell’s blog, you can see that he used strawberries. Unfortunately, strawberry season in Italy is over, so I replaced them with cherries. In this semifreddo recipe I used whole-milk Greek-style yogurt instead of heavy cream to lighten up the dessert! Half the melon crosswise. 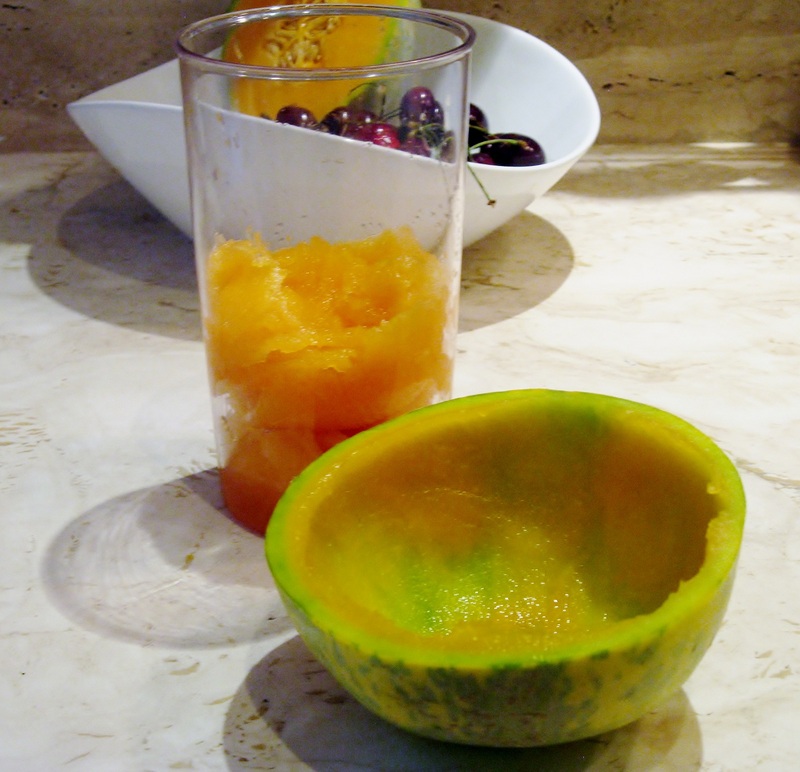 Scoop out seeds.Remove flesh from the melon and set aside. Keep melon rinds. Pit cherries and cut in halves lenghtwise. Using an immersion blender, purée melon flesh until smooth. Set aside. Whisk egg yolks with brown sugar in a bowl. Set bowl with yolk mixture over a saucepan of simmering water (this method is called baño maría or bain-marie). Whisk constantly until mixture thickens. Set aside to cool down. Using an immersion blender, beat mixture until thick. Beat egg whites in another large bowl until soft peaks form. Gradually add the egg yolk-sugar mixture, and beat until stiff. Fold in Greek yogurt and melon purée. Blend well. 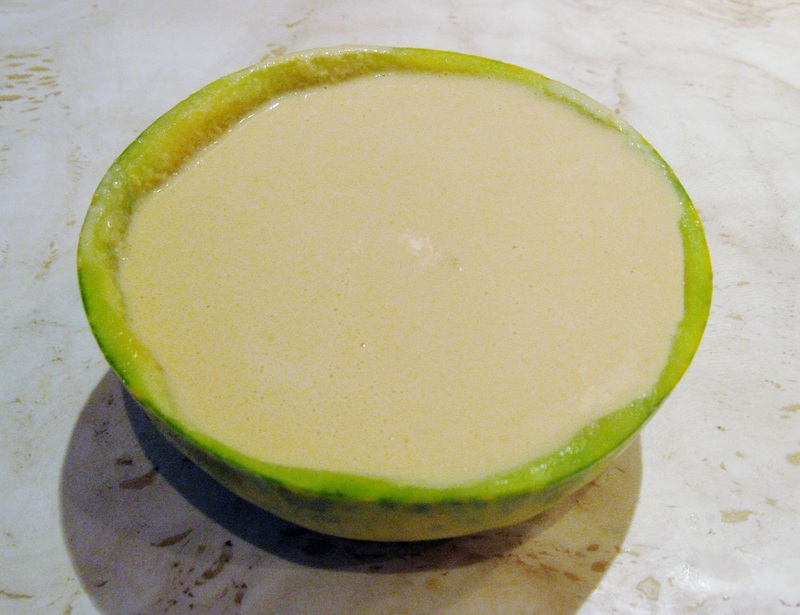 Fill each melon rind with the melon yogurt semifreddo mixture. Cover with plastic wrap and freeze overnight. Since I got some extra semifreddo mixture, I filled some silicon molds (of about 6 cups each) making up about 12 small cups of semifreddo. 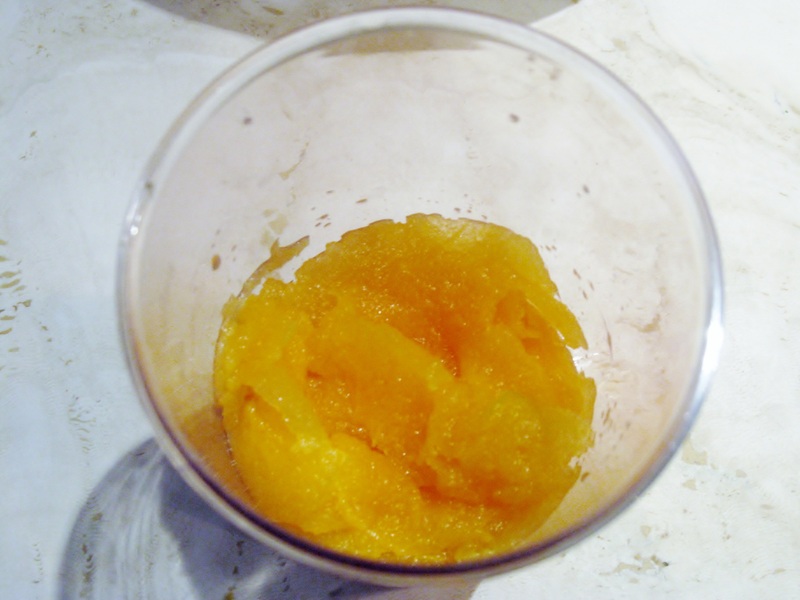 Take melon rinds from the freezer and with the use of a teaspoon scoop out the center from each rind. 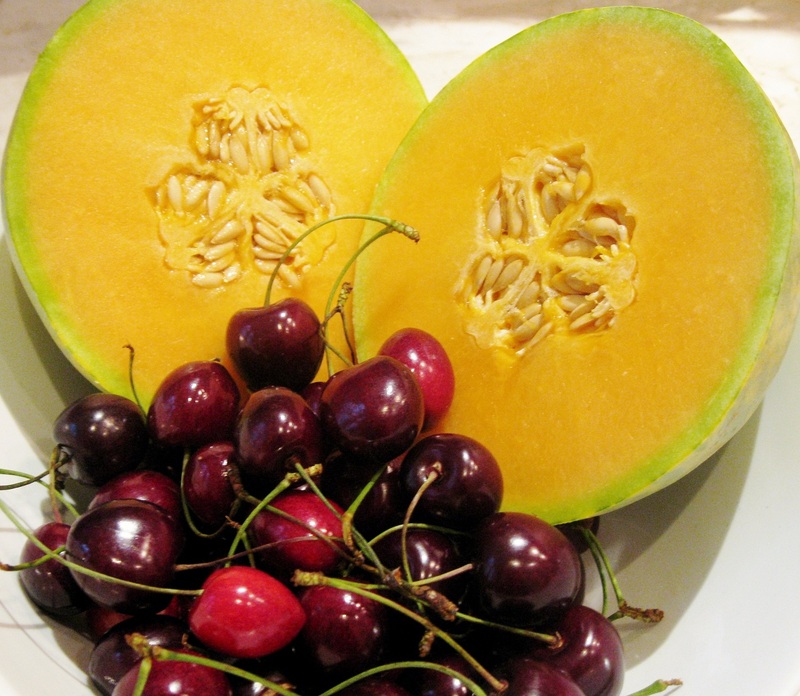 Place cherries in the melon cavity. 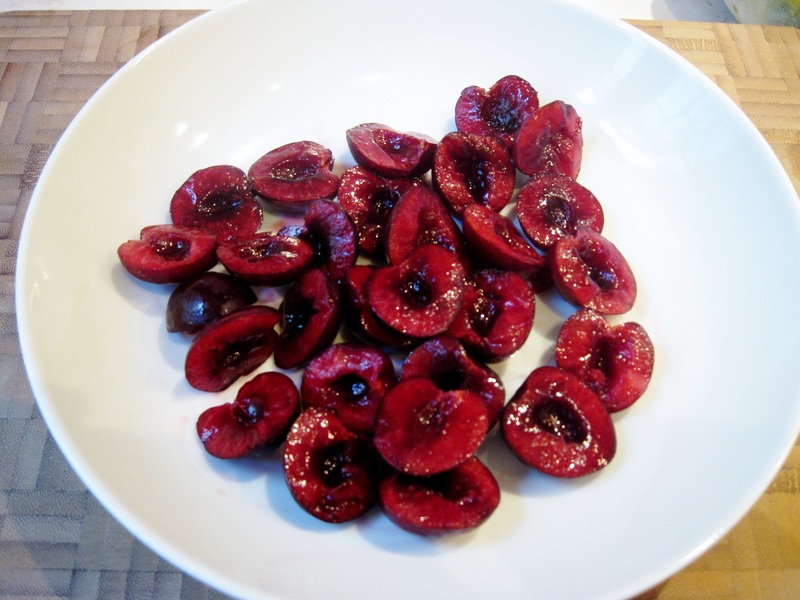 For the cups, remove them from the silicon molds and place two cherry halves on top of each. Garnish with a mint leave. What a wonderful & creative idea! And how refreshing. Very nicely done! It is very refreshing!!! Thank you!! I was “tag surfing” and clicked on this recipe becaase it looked so fantastic, then realised it was you…you´ve changed, looks great! And I love this dish…perfect for summer and I like that you´ve used yogurt not cream. Un abrazo. Gracias chica!!!!! Un abrazo a ti tambien!! I loved that picture! Such a brilliant presentation and great dessert. Strawberry season is long gone here too. I love semifreddo and you don’t need a gelato maker (gelatiera) to make it!! Great idea – I’ve never made a semifreddo. I particularly like the small versions, and the idea of nuts stuffed with gelato. Great post. Thank you!!! I am glad you liked it! I’ve never heard of this before…but I absolutely love the idea! Gorgeous presentation and just the right dessert for these hot summer months. Great post on detailing the steps involved; I really have to try this out! Try it! it is easy to make and you can use any flavor you like. I love semifreddo too and this looks so beautiful. I’ll have to try it – it sounds a great idea to use yoghurt for it. I love yogurt – specially the greek one. It is fresh and healthier than heavy cream. I have always wondered what gelato and semifreddo were. This looks so amazing and fresh, I love your photograph of the melon with the semifreddo, and the blue background, it makes it stand out so well. What does semifreddo mean? Thank you!! The main difference is in the making and the texture. Semifreddo (similar to French parfait) is made with whipping cream ( for this recipe I replaced it with Greek yogurt ) and whisked eggs. You combine ingredients and put them in a freezer. Gelato is usually made of milk and eggs and you need a gelato maker (gelatiera) that continuously mixes the batter. Since Semifreddo is more solid than gelato, it gives a less cold sensation than gelato (that’s why it is called semifreddo meaning half cold). This is because semifreddo contains less water than gelato. I have had an orange prepared like yours but it was very ordinary in it’s presentation. Yours is absolutely beautiful. Thank you Karen! But I bet your orange was delicious!!! I absolutely adore your presentation of this… looks amazing. I definitely have to try this melon yogurt out. Thank you Semifreddo is one of my favorites desserts..so easy to make!